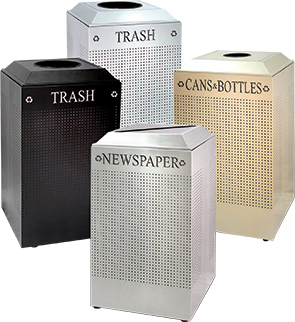 The contemporary design of perforated steel combined with classically styled lids provides an upscale look that's perfect in any environment in need of recycling receptacles. Choose from three item-specific lid openings to support your unique recycling program. Piano hinged lids and folding retainer bands low for easy access and keep liners out of sight.